The requirement for an alternate depends on the aircraft category, equipment installed, approach navigational aid (NAVAID), and forecast weather. For example, airports with only a global positioning system (GPS) approach procedure cannot be used as an alternate by TSO-C129 or C196 users unless certain requirements are met (see AIM) even though the “N/A” has been removed from the approach chart. For select area navigation (RNAV) GPS and GPS approach procedures, the “N/A” is being removed so they may be used as an alternate by aircraft equipped with an approach-approved Wide Area Augmentation System (WAAS) receiver complying with (TSO-C145 or C146) or TSO-C129 or C196 meeitng certain requirements (see AIM). Because GPS is not authorized as a substitute means of navigation guidance when conducting a conventional approach at an alternate airport, if the approach procedure requires either distance measuring equipment (DME) or automatic direction finder (ADF), the aircraft must be equipped with the appropriate DME or ADF avionics in order to use the approach as an alternate. For aircraft other than helicopters, 14 CFR Part 91 requirements, an alternate airport must be listed on IFR flight plans if the forecast weather at the destination airport, for at least one hour before and for one hour after the estimated time of arrival (ETA), the ceiling is less than 2,000 feet above the airport elevation, and the visibility is less than 3 SM. One way to remember the rules for determining the necessity of filing an alternate is the “1, 2, 3 Rule.” For helicopters, similar alternate filing requirements in 14 CFR Part 91 apply. An alternate must be listed on an IFR flight plan if at the ETA and for one hour after the ETA, the ceiling is at least 1,000 feet above the airport elevation, or at least 400 feet above the lowest applicable approach minima, whichever is higher, and the visibility is at least 2 SM. Not all airports can be used as alternate airports. An airport may not be qualified for alternate use if the airport NAVAID is unmonitored, or if it does not have weather reporting capabilities. For an airport to be used as an alternate, the forecast weather at that airport must meet certain qualifications at the ETA. For aircraft other than helicopters, standard alternate minimums for a precision approach are a 600-foot ceiling and a 2 SM visibility. For a non-precision approach, the minimums are an 800-foot ceiling and a 2 SM visibility. Standard alternate minimums apply unless higher alternate minimums are listed for an airport. For helicopters, alternate weather minimums are a ceiling of 200 feet above the minimum for the approach to be flown, and visibility at least 1 SM but never less than the minimum visibility for the approach to be flown. IFR alternate minimums for Part 121 and Part 135 operators are very specific and have more stringent requirements than Part 91 operators. 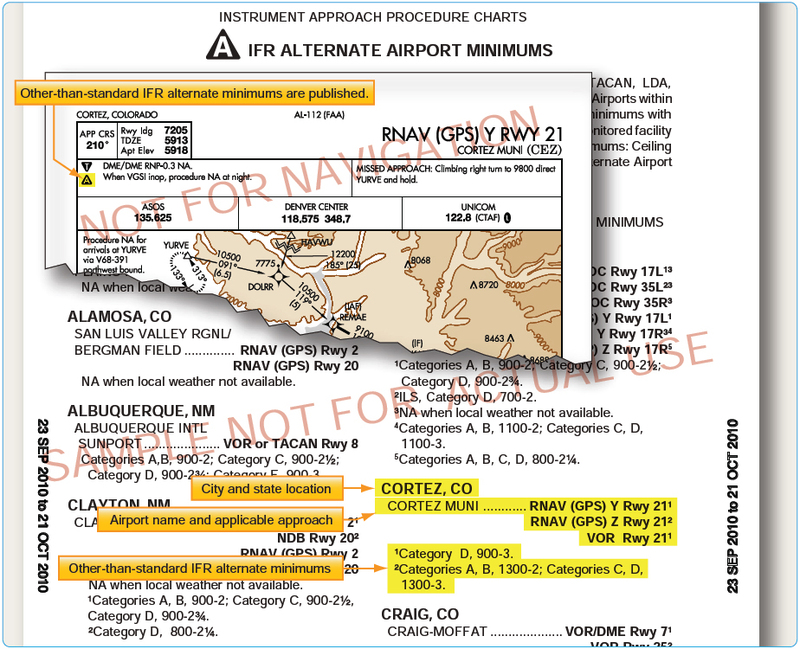 Part 121 operators are required by their OpSpecs and 14 CFR Part 121, § 121.617 and 121.625 to have a takeoff alternate airport for their departure airport in addition to their airport of intended landing if the weather at the departure airport is below the landing minimums in the certificate holder’s OpSpecs for that airport. The alternate must be within two hours flying time for an aircraft with three or more engines with an engine out in normal cruise in still air. For two engine aircraft, the alternate must be within one hour. The airport of intended landing may be used in lieu of an alternate provided that it meets all the requirements. Domestic Part 121 operators must also file for alternate airports when the weather at their destination airport, from one hour before to one hour after their ETA, is forecast to be below a 2,000-foot ceiling and/or less than three miles visibility. Adding 400 feet to the authorized CAT I height above airport (HAA)/height above touchdown elevation (HAT) for ceiling. Adding one mile to the authorized CAT I visibility for visibility minimums. This is one example of the criteria required for Part 121 operators when calculating minimums. Part 135 operators are also subject to their own specific rules regarding the selection and use of alternate minimums as outlined in their OpSpecs and 14 CFR Part 135, § 135.219 through 135.225, which are similar to those used by Part 121 operators with additional considerations. Commercial operators typically use dispatchers to plan flights, including selecting and filing alternate airports. The dispatcher considers aircraft performance, aircraft equipment and its condition, and route of flight when choosing alternates. In the event changes need to be made to the flight plan en route due to deteriorating weather, the dispatcher maintains contact with the flight crew and reroutes their flight as necessary. Therefore, it is the pilot’s responsibility to execute the flight as planned by the dispatcher. To aid in the planning of alternates, dispatchers have a list of airports that are approved as alternates so they can quickly determine which airports should be used for a particular flight. Dispatchers also use flight planning software that plans routes including alternates for the flight. This type of software is tailored for individual operators and includes their normal flight paths and approved airports. Flight planning software and services are provided through private sources. Though the pilot is the final authority for the flight and ultimately has full responsibility, the dispatcher is responsible for creating flight plans that are accurate and comply with the CFRs. Alternate minimum criteria are only used as planning tools to ensure the pilot in command and dispatcher are thinking ahead to the approach phase of flight. In the event the flight would actually need to divert to an alternate, the published approach minimums or lower-than-standard minimums must be used as addressed in OpSpecs documents.